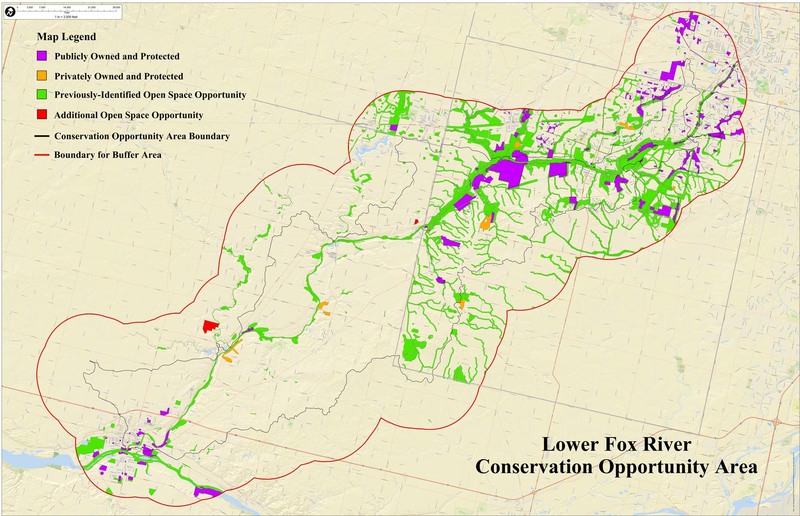 The voluntary Lower Fox River Land Conservation Planning Project began to develop a recognized plan to guide local preservation entities and individuals in land preservation efforts along the Lower Fox River, its tributaries and the Lower Fox River Conservation Opportunity Area. The Kendall and LaSalle County portions of the Lower Fox River watershed have been identified as having important conservation value by the Illinois Department of Natural Resources. Was developed by a diverse group of local stakeholders in Kendall and LaSalle Counties. including private landowners, local municipalities, counties, agencies and other groups facilitated by The Conservation Foundation. Determined priorities regarding natural resource protection. May raise the likelihood of obtaining funding for projects by complying with the local and state plans. This planning phase of this strictly voluntary project was led by the stakeholders with support from The Conservation Foundation, who served as a facilitator. Mission: To encourage voluntary actions that will preserve and protect the highest quality natural areas in the Lower Fox River Watershed Conservation Opportunity Area. The final product of this planning process is a prioritized map of parcels that would benefit from voluntary preservation measures. The map will serve as a coordinated guide to landowners, municipalities and conservation organizations to supplement their existing plans. By acting in accordance with this guide, voluntary preservation projects could receive priority status for grant funding. Download the brochure for the project. To learn more about what we are doing in Kendall County, click here.